Now, continue on reading Act 2 and see how our interns manifest their potential! And of course, apply to our internship program! 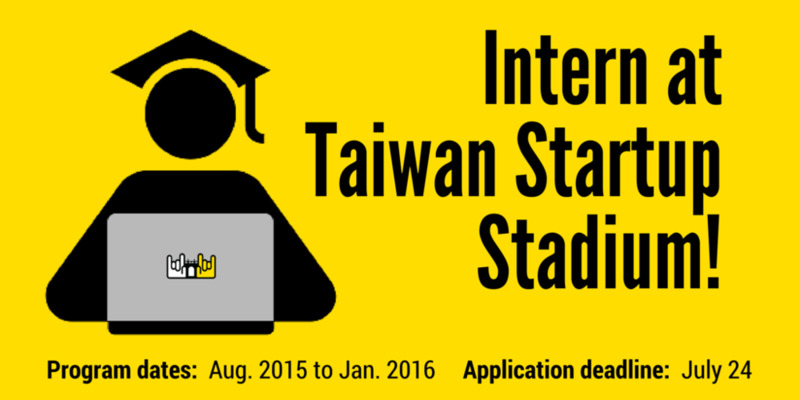 PLEASE NOTE: The 2015 Taiwan Startup Stadium Internship Program deadline has passed! Q: How/when will I know whether or not I was accepted? Qualified applicants will be notified of an interview opportunity by the end of July, and we'll announce the selected candidates in August. Q: I missed the deadline. Can I still apply?/Will there be another program soon? It's too late to apply for the current program, but we'll announce future internship opportunities through our Facebook, Twitter, and TSS newsletter. The next program will likely be announced in early 2016. We are looking for passionate, driven and energetic student interns at Taiwan Startup Stadium build the foundations for the startup database and business landscape research. The interns will be based in our office in Taipei, Taiwan to work very closely with our team to shape startup companies' critical decisions. We are a team of dedicated and creative people with a common vision for supporting Taiwan startups. The pace here is rapid and the sense of accomplishment is big! Work at Taiwan Startup Stadium, and enjoy a collaborative work environment and the knowledge that you will enrich lots of startups. Let’s rock the world! Get to know lots of cool people from startups, VCs, TSS partners, etc.